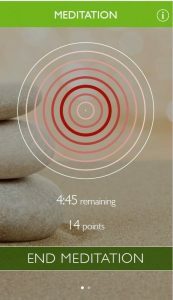 We have developed an app to help beginners to meditate. The app is based on biofeedback receiving from the iWatch. 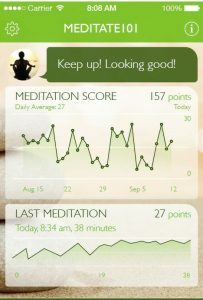 The main idea behind this app was to help the user achieve the optimal meditative state. A lot of people who start to meditate do not know what is the desired state and are asking how I can know that I am meditating. There are several physiological states that are connected to mediation, decreasing heart rate, increase in skin resistance, certain brain waves and heart rate variability coherence. With introducing the iWatch to the market we could use the fact that iWatch measures the heart rate to develop an application which gives you biofeedback if you are in mediation or not and how deep it is. We have used the fact that iWatch provides heart rate. When you are in mediation you have very high heart rate variability coherence. The coherence is increasing when you are more relaxed. We have transferred the signal of heart rate from iWatch into iPhone. When user meditates he wears iWatch and on iPhone there is picture which lights up when user has reached the desired state -the high coherence. There are various statistics in the app that will give you feedback about your mediation practice progress over time. 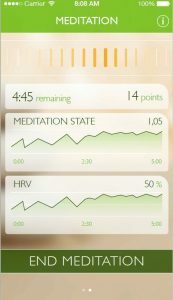 We have developed the app which gives the user who is mediation beginner real time biofeedback if he is in meditative state. The feedback is providedby iWatch.